Naar aanleiding van een aantal éénmalige Engelstalige bezoekers, heb ik deze boekrecensie in het Engels geschreven :-). Mijn excuses voor schrijffoutjes! You might wonder how a book review is related to a fashionblog? Well, the reason is that fashion is everywhere, also in literature. Even if you are a complete layperson in the fashionworld, after reading the book series of Lindsey Kelk, you will care about the difference between Jimmy Choo’s and Louboutins! Lindsey Kelk’s book I heart London, which is the fifth and also the last installment of the I heart series, is an enjoyable and fluent book. These series are typical female books and well-balanced between humor and suspense, comparable with a romantic comedy on television. The British author and journalist wrote this book collection based on her own experience in cities like New York, Paris, Las Vegas and London. The environment descriptions are therefore very promising. At the center in the I heart series is Angela Clark. She is a 28 years old British blogger for a fashion magazine. During her life Angela has faced with extraordinary problems. Her clumsiness makes it often hard to deal with these issues, which gives the stories a humorous touch. She is engaged to Alex Reid, a New York rock artist, who is trying hard to calm down his girlfriend. Furthermore, Jenny Lopez and Louisa include an important part of Angela’s life as her two best friends. Their opposite characters: Jenny is a crazy New York girl, with quite some emotional ups and downs, whereas Louisa is a responsible English mother, makes it difficult to place them together in the same room. The tension between these two girls is often highlighted in I heart London, but the central idea of this final book is the planning around the wedding. In the first book Angela found her fiancé cheating on her during the wedding of her best friend. After ruining the party she decided to flee to New York in an attempt to assimilate this terrible evening. She lost her heart to the city as well as to Alex Reid and build up a new life in the Big Apple. After two years and twenty petitions of her mother, Angela has no other opportunity than go back to London to clean up the things she left behind her. All over a sudden the couple decided to marry during that week in London. Of course this is not going to happen without a good portion of awkward problems. 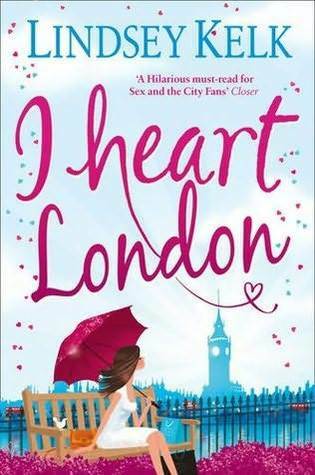 With this plot I heart London is perfect in line with the previous versions: in every book the adventures of Angela take place in a different city with a large amount of fun and romance, but also with a huge respect for friendships. One of the strengths of these series is Lindsey Kelk’s writing style, which is fluent, relaxed and above all humorous. The way she creates nonexistent words by just linking together existing words like ‘just-because-I-love-you-cards’, is adorable. Moreover the books easily permit imaging the adventures. In that way the grade of transportation during the storyline is constantly high. This is partly due to the first person writing, but also to the detailed descriptions of the cities. The language use is not always that nice in terms of gentility, but the regular curses just contribute to the human feeling. Her word choice is interesting and unusual at the same time. Sentences like “Alex touched me, I spinned”, seem wrong, but just feel right. One of the weaknesses of these series seems to be its predictability. Nevertheless, this don’t bother me. The little writing errors on the contrary are sometimes annoying, but apparently this the translator’s responsibility, not the author’s. To conclude, I heart London is a pleasure to read. The entertaining grade is high from the first till the last page and in that way the stories generate a good feeling. Romantic scenes constantly alternate with girls problems, which contributes to the perfect relaxation. ← Donderdag 10 oktober: Birdy!